Kit and Cat Seaton are sibling storytellers collaborating on the graphic novel The Black Bull of Norroway. 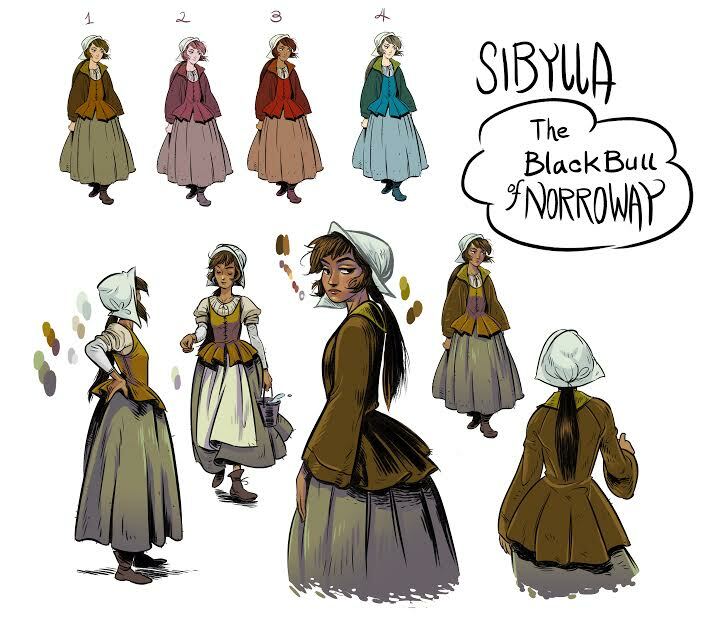 Based on a classic fairy tale, The Black Bull of Norroway is the story of Sibylla, a nine-year- old whose life is forever changed by a forest witch who tells her that she will become the bride the Black Bull of Norroway. As things unfold, Sibylla comes to terms with a fate she’s not sure that she wants. Kit Seaton, the older sister, is an artist living in Savanah, Georgia, where she teaches as Savanah College of Art and Design. She has an M.F.A. from the University of Hartford and has maintained her own webcomic, Eve of All Saints, since 2011. Cat Seaton is a playwright and storyteller living in Portland. She has a B.A. in English & writing from southern Oregon University. Cat writes the script, and Kit transforms them into sequential art. We talked about Kit & Cat Comics and The Black Bull of Norroway. EB: First off, are your names really Kit and Cat? Kit & Cat: We actually get this question a lot. No, Kit and Cat are not our real names, but we’ve both been going by our respective nicknames for over ten years now. Kit was starting college and I was starting sixth grade, and both of us encountered several other students sharing our given names. So we nicked them, completely independently of one another, and found out after the fact. EB: Is this your first creative collaboration? Kit & Cat: It’s the first collaboration we are presenting to the public, but we’ve been meaning to work together for years. EB: What is Kit & Cat Comics? Kit & Cat: Kit & Cat Comics is the name of our studio. We just thought the consonants in Kit, and Cat, and comics made for a much nicer flow than a sussurous “Studio” at the end would have. Plus, we really do intend to make primarily comics. It’s run by my sister and myself, with Kit doing all of the art, and me doing the writing. 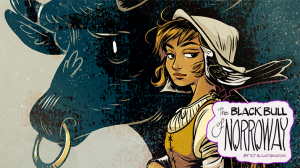 EB: The first comic is called The Black Bull of Norroway, which is an adaptation of a Scottish fairy tale. How did you come to choose that? Kit & Cat: When Kit was in her graduate program at Hartford, she began a project using East of the Sun and West of the Moon. At that time, she approached me with the idea of creating an adaptation. We’ve both always shared a love of fairy tales, fables, and storytelling. I agreed, of course, but when I looked into it I discovered the tale had already been adapted a number of times. It just so happened that I was taking a storytelling class around the same time, and so I had been reading a lot of fairy tales. The Black Bull of Norroway was one of those, and I realized it was a very similar tale. It had all the aspects that made East of the Sun and West of the Moon so palatable to us: strong female lead, magic and adventure, enchantment, themes of truth and illusion…and of course…gigantic animals. I approached her with the idea of using Black Bull instead, and it clicked with her immediately. EB: Tell us about the main character Sibylla? Kit & Cat:When we begin the second chapter, Sibylla is a moody seventeen year old girl. She’s living all by herself in her family’s house, her sisters have gone off and married other people, and she’s been left behind. And part of her is fine with that, but part of her is really discontent. What we tried to do was, we worked really hard to turn the classic fairy tale into a Bildungsroman. So, we start with Sibylla as a young child, and really try to introduce her strongest character traits right off the bat. She puts on a brave face, she refuses to back down, she has this need to be first and to be right… but we also see her age, see her grow up, see her loneliness. We see her run from a lot of things, instead of facing them. She’s very non-confrontational in spite of her bravado, so we come to understand that Sibylla really only puts a brave face on things. She doesn’t know the true definition of courage. As the story progresses, we get to see her grow up. EB: Do you have a target audience in mind? Kit & Cat: Really firmly in young adult, I think. We do deal with some darker themes, but what young adult novel nowadays hasn’t dealt with that? EB: Have you always been interested in the graphic format? Kit & Cat: Yes. Even when we were younger and still living at home, every story we’ve ever told or planned out has been meant for a graphic format. EB: And how do you collaborate? What’s your process? We are constantly sending each other works-in-progress and asking for feedback. It’s this strange combination of doing the work apart, since I script and she draws, but constantly inviting critique from the other. I have to admit, most of the reworking happens in the writing stage, since it’s easier for me to change the direction of the story there than it is to force her to draw something over, but we’re both really open to changes and suggestions from the other person. I guess that’s the main thing. Our process demands us to be open and honest with each other at all times. EB: Any thoughts on why the fairy tale is such an enduring and popular form? Kit & Cat: Because people love stories, and these are stories that have been told around the fire and passed down, and have been honed and sharpened for generations. They’ve been distilled into their purest forms and characters; they take larger themes and cut them into parts, make them palatable, give us hope that we too can deal with those issues. To use a quote I’m sure we’ve all seen a thousand times: stories don’t tell us monsters exist, they tell us monsters can be beaten. There are exceptions, of course. Some fairy tales end badly for everyone involved. But for the most part, I feel that fairy tales offer us a light to shine inside of ourselves. They help us illuminate the darkness within us, so that we can parse it out, and understand what makes us human. EB: What’s next for Kit & Cat comics? Kit & Cat: Well, Black Bull of Norroway is going to span a few years time. While we have the story plotted, there’s still a lot of writing and a lot of drawing left to do. We have some really great things far, far on the horizon, but Black Bull of Norroway sort of represents our past and future right now. It’s no small project. It will span three books, in all likelihood. It’s quite a commitment. EB: How can readers subscribe? 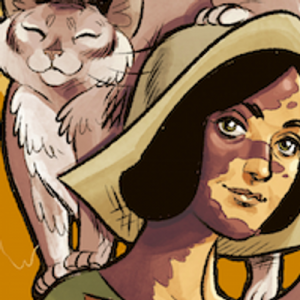 Kit & Cat: Readers can find us on Patreon (http://www.patreon.com/kitcat) if they’re interested in supporting the project! Patreon users receive advance pages, as well as exclusive content, and subscriptions start as low as $1. The webcomic is also available for free at http://blackbullcomic.tumblr.com and http://blackbullcomic.smackjeeves.com , with weekly updates that happen on Fridays. The entire first chapter is already available to read, so people will definitely be able to whet their appetites on it.